After weeks of waiting, Halloween finally came. 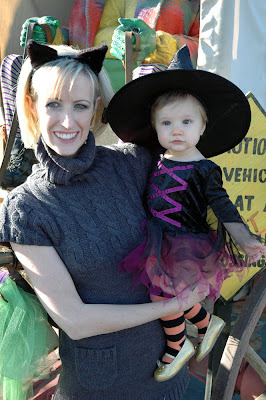 I wasn't really sure what would prove to be so special about Halloween, but I did know one thing: I would finally get to wear my witch costume. 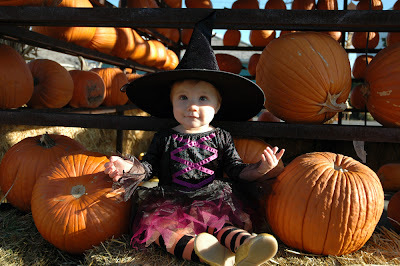 My parents decided to take me to Gardner Village so they could take my picture next to some big pumpkins. 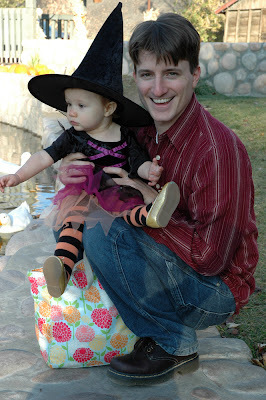 I think you'll agree I looked much better in the witch costume than Lily Mae would have. Unfortunately for me, they just kept taking picture after picture. This was kind of boring, but what's a girl to do? Then the rest of my cousins arrived with Aunt Maddie. 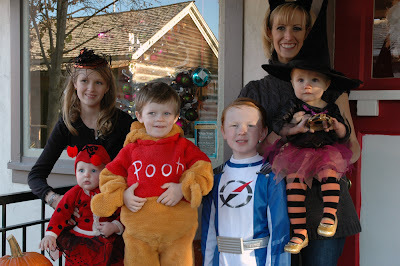 Seth was dressed up as Winnie the Pooh, Luke was a Power Ranger, Annissa was a ladybug, and Sophie was Pooh's pot of honey. Annissa and Sophie were both sleeping so their mommies had to hold them. Note to self: pretending to be asleep can get you out of endless picture-taking. Just when I thought the picture-taking was over, Annissa decided to wake up. So then we had to start all over again. Thank goodness Sophie was smart enough to keep sleeping. I just wish I had thought of that. 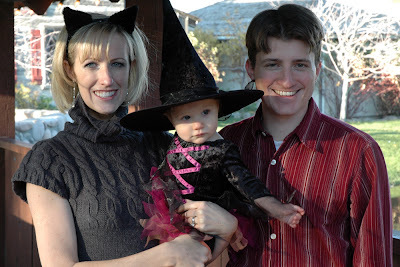 Then my mommy and daddy wanted pictures with me too. 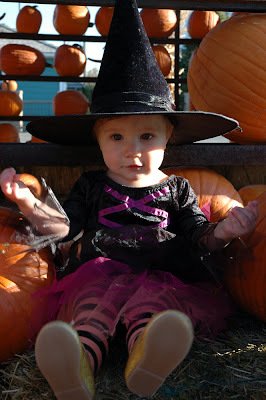 At this point, I was beginning to think I should have let Lily Mae be the witch after all. Just when I thought I couldn't possibly bare to pose for another picture, I noticed some ducks floating around in a pond. I kept looking for Donald, but couldn't spot him. In the meantime, my mom was trying in vain to get me to look at the camera. 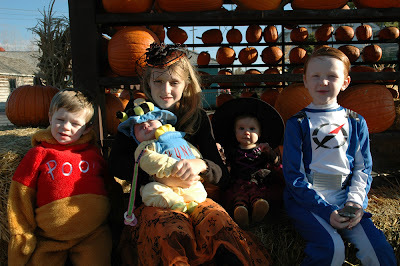 Finally the pictures ended and we left to do some strange activity called trick-or-treating. It basically consisted of my parents walking me from one interesting place to another, but never letting me down to explore. At each place we went to we collected these brightly-colored little toys in a bag, but I was not allowed to ever play with them. What a tease! And I thought the picture-taking was frustrating. I'm staying home next year. 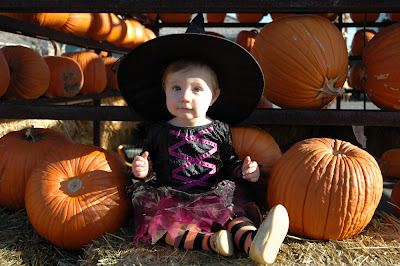 Lily Mae can have her witch costume. Ava looks darling! She is such a good picture taker. She is a natural in front of the camera. 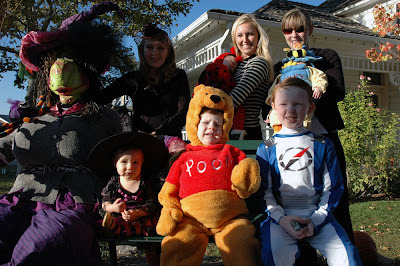 It was sure fun having everyone at Gardner Village to take pictures. She's too cute!! I love her costume and expressions!! too fun! !